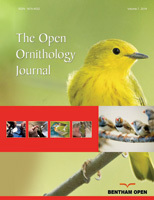 The Open Ornithology Journal is an Open Access online journal, which publishes research, reviews and letter articles in the field of ornithology, aiming at providing the most complete and reliable source of information on current developments in the field. This journal publishes open access reviews on recently published books (both print and electronic) relevant to the journal. Publishers and authors of books are invited to contact our book reviews editor at tooenij@benthamopen.net with book review requests. All submitted books will be reviewed by an independent expert in the field. No page charges will be levied to authors for the publication of book reviews. Authors are encouraged to consult reporting guidelines. These guidelines provide a set of recommendations comprising a list of items relevant to their specific research design. All kinds of measurements should be reported only in International System of Units (SI). In case there is a need to present lengthy, but essential methodological details, which can be a part of the article. An appendix must not exceed three pages (Times New Roman, 10 point fonts, 900 max. words per page).The information should be provided in a condensed form, ruling out the need of full sentences. A single appendix should be titled APPENDIX, while more than one can be titled APPENDIX A, APPENDIX B, and so on. The authors will be required to submit the Microarray experiment data to the ArrayExpress using the MIAMExpress submission tool (www.ebi.ac.uk/miamexpress), which will be subjected to reviewing by the curation team and if accepted, an ArrayExpress accession number would be assigned for it. The ArrayExpress offers the facility to maintain the data until the related paper is published. Microarray data should be made available for reviewers and editors at the time of manuscript submission in a MIAME compliant and widely accessible format. Submission of large raw and/or analyzed microarray data files as supplementary data to the journal should be discouraged, which may alternatively be submitted either to the Gene Expression Omnibus http://www.ncbi.nlm.nih.gov/geo/ or ArrayExpress http://www.ebi.ac.uk/arrayexpress repositories, thereby obtaining an accession number for the journal and any necessary passwords, to facilitate the reviewers and editors of a manuscript to access the data. The submission of the microarray data to either of these repositories should be done at or before acceptance of a paper for publication, with accession number being allotted well before publication. The SI units should be used; if not exclusively, please provide the SI value in parentheses after each value. Species names should be italicized (e.g., Homo sapiens). The generic name of a species should be given in full the first time it appears in the text. The author authority for each species is desirable on its first mention. Chemical formulae may not be used as abbreviations in the text. Genes, mutations, genotypes, and alleles should also be indicated in italics but the protein product of a gene should be in Roman type. Use the recommended name by consulting the appropriate genetic nomenclature database, e.g., HUGO for human genes. It is sometimes advisable to indicate the synonyms for the gene the first time it appears in the text. Gene prefixes such as those used for oncogenes or cellular localization should be shown in roman: v-fes, c-MYC, etc. In case of usage of symbols that do not conform to those that have previously appeared in the literature, their aliases may be obtained from the approved nomenclature in the HGNC (HUGO Gene Nomenclature Committee) [http://www.genenames.org/] and LocusLink, to allow retrieval of all the information available for each gene. The Latin name and taxonomic authority (e.g. Linnaeus) should be given for all experimental species. Chemical nomenclature must conform to the Subject Index of Chemical Abstracts. All appropriate datasets, images, and information should be deposited in public resources. Please provide the relevant accession numbers (and version numbers, if appropriate) and any necessary passwords to enable the reviewers and editors of a manuscript to access the data. Providing accession numbers facilitates linking to and from the established databases and integrates the article with a broader collection of scientific information, therefore list all accession numbers should be listed directly after the Supporting Information section. All accession numbers for all entities such as genes, proteins, mutants, diseases, etc., for which there is an entry in a public database should be included in the manuscript. Experimental data should be submitted to the appropriate databases, with a release date corresponding to the date of publication. Stokstad E. Ornithology. Gambling on a ghost bird. Science 2007; 317: 888-92. Rubenstein DR, Lovette IJ. Temporal Environmental Variability Drives the Evolution of Cooperative Breeding in Birds. Curr Biol 2007; 17: 1414-19. Reed JM, Boulinier T, Danchin E, Oring LW In: Nolan V, Thompson C, Ed. Prospecting by Birds for Breeding Site, New York, Plenum publishers 1999; 189-259. Baicich PJ, Harrison CO. A guide to the nests, eggs, and nestlings of North American birds. 2nd ed. San Diego:Academic Press 1997. Ken A, Otter, Eds. The ecology and behavior of chickadees and titmice : an integrated approach. New York: Oxford University Press 2007. Oschadleus HD, Underhill LG. Wetlands and Development Studies of Migratory Waterbirds. In: Beintema A, van Vessen J, Eds. Proceeding of the 2nd Conference; 1999: Dakar, Wetlands International Publication 1999; pp. 53-7. Harris AH, Ed. Economics and health: 1997: Proceedings of the 19th australian conference of health economists; 1997 Sep 13-14; Sydney, Australia. Kensington, N.S.W: School of Health Services Management, University of New South Wales 1998. Moszynski P. Africa is ill equipped to fight a bird flu epidemic 2006. BMJ [serial on the Internet]. 2006 Feb 18; [cited 2006 February 18]; 380: [about 10 screens]. Available from: http://www.bmj.com//content/332/7538/380.3. Storch I. Conservation status of grouse worldwide: An update. Wildlife Biology 2007; 13(Suppl 1): S5-12. Etterson MA, Etterson JR, Cuthbert FJ. A robust new method for analyzing community change and an example using 83 years of avian response to forest succession. Biological Conservation 2007; 138(4 Pt 3): 381-89. Coroneos DL, inventor. Anti-squirrel bird feeder. United States patent US 6918353. 2005 July. Special care should be taken for the punctuation convention as described in the above-mentioned examples. All authors must strictly follow the guidelines below for preparing illustrations for publication in The Open Ornithology Journal. If the figures are found to be sub-standard, then the manuscripts will be rejected.